It's only been a few days since the first Hobbs & Shaw trailer was released and the Super Bowl has provided us with a fresh new look. Response to Friday's sneak peek has been mixed, but that's to be expected when you're only seeing 3 minutes of a movie with a bunch of clips that are shown out of context from each other. However, the big reveal that Idris Elba's villainous Brixton character has super powers has some Fast and Furious fans freaking out a little. Thanks to the Super Bowl, we now have another, albeit shorter, look at Hobbs & Shaw. From all angles, this movie looks like it's going to be massive and a bit of a change up for the Fast and Furious franchise. Dwayne Johnson and Jason Statham's characters do not want to work with each other, which is evident from the start, but it's the rift that brings them together to go up against the "bulletproof" Brixton, who has super powers. While some Fast and Furious fans have been dismissive about the super power elements in Hobbs & Shaw, others are all for it and embracing the new addition, which was shown off in the first Hobbs & Shaw trailer. It adds a comic book vibe to the franchise that fits in surprisingly well, and as more than a few fans have said, we're shocked that they didn't think of this a lot sooner. Heck, we've heard rumors of the Fast and Furious franchise going to space, so what's wrong with a few super powers? Regardless, the two recent pieces of promotional material promise a really fun popcorn movie. Part of the fun about the Fast and Furious franchise is that it's all ridiculous. That's what we all love about it, and Hobbs & Shaw is doubling down on the ridiculousness. While we don't know much about Idris Elba's Brixton character, we all want his backstory to be crazy and full of fantasy details, which have been hinted at in the first two pieces of promotional material that have been given to us. Like all good trailers, they both leave us wanting more of that ridiculousness and more of the weird relationship between Luke Hobbs and Deckard Shaw. Hobbs & Shaw hits theaters on August 2nd, which is the perfect time for this particular movie. The late summer box office is going to get a kick in the pants this year, courtesy of Dwayne Johnson and Jason Statham. And if all goes well, which it probably will, we'll probably get some more installments in the future. Both Statham and Johnson had a lot of fun making the movie and it shines through everything that we've seen so far, and that might be the key to making the Fast and Furious franchise move forward. 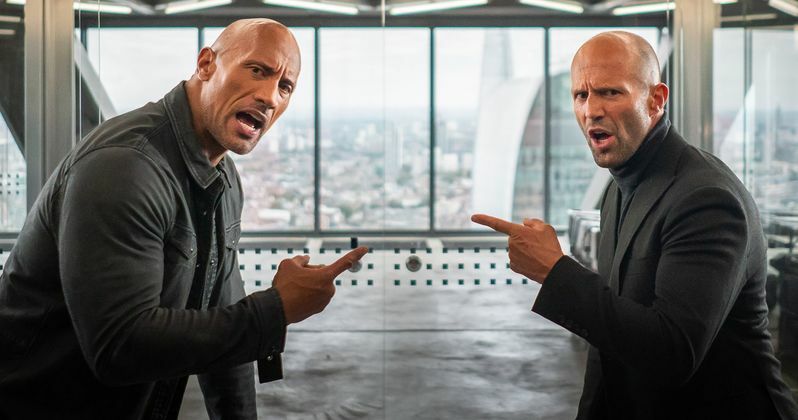 You can check out the latest Hobbs & Shaw footage below, thanks to Universal Pictures.